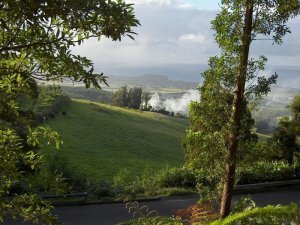 Brava’s high mountains produce much rainfall and hence abundant flower-filled gardens like Madeira, from which many of the settlers originally came. Brava. 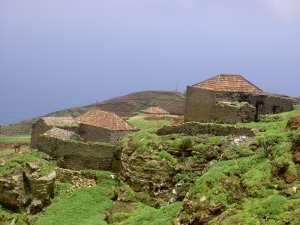 the smallest inhabited islandt is mountainous with deep ravines filled with vegetation and a rugged coastline. 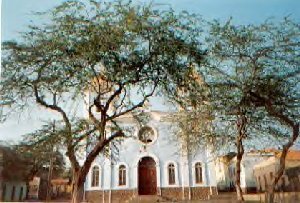 Discovered in 1462, Brava was only inhabited in 1680 when an eruption on Fogo forced the settlers to move. Farming and fishing produce a scant living for Bravans. Coffee, sugar cane, manioc, corn and potatoes grow, while tuna, lobster, limpet and conch enliven the Bravan diet. 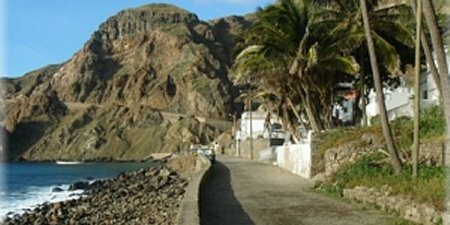 The skilled Brava mariners were popular recruits to the whaling fleets from New England,where 400,000 Cape Verdeans many of them Bravans now live. . English is widely spoken on Brava.
. That of the poet Eugenio Tavares is the best in the Cape Verdes. It has the inevitable church, a bar and one small hotel. Above Nova Sintra a good view of the town and harbour of Brava is sometimes visible through the mists. The farm land of Brava where crops are grown on tiny terraces carved out of the mountain side fed by spring water. Unusual, brightly plumed birds can sometimes be seen wheeling above the fields. 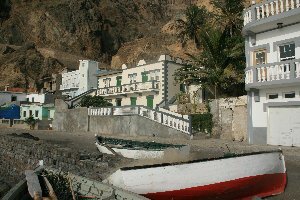 Brava`s fishing port locked into a tiny bay only a few hundred metres across and dominated by a small chapel for thanksgiving on surviving the sea. 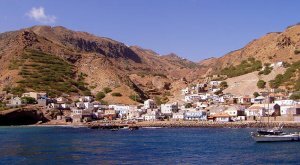 A small village snuggled in a sheltered bay at the foot of a mountain. It is the best spot on Brava, since it escapes the cloud and mist is Faja d`Agua. A little strung out fishing village lying around a long bay with a backdrop of steep mountains behind. This looks out on the setting sun towards Brazil. Whalers used to anchor and send longboats ashore for provisions and Bravan recruits. There are fine views from the mountain top when the cloud lifts. Sorno, is on a sheltered overlooked by a rocky outcrop with terraced plantations, where a natural spring runs down the steep slopes. Through the 19th century as many as 100 American whalers from New Bedford would anchor in the bay each year to recruit fresh crew. from Brava. Most never returned. A typical mountain village, with fine scenery and views, but not much else. Brava is certainly the most remote and unvisited island, yet it has great charm. 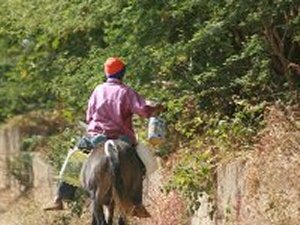 You can only get there by cargo ship, the elderly listing Barlovento ( now sunk) which carries goats and donkeys as well or the more modern Sal Rei which usually depart from Fogo at the same time. Cancellations are frequent. A more modern ship the Musteru is promised for the two hour trip to Brava from Fogo but let`s wait and see. 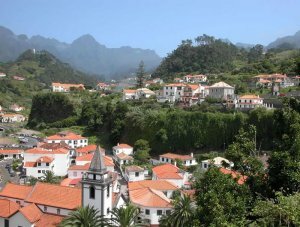 Brava was originally populated by Europeans not Africans who did not fare well in the Brava climate which can be cool especially when clouds or mist hover over Nova Sintra. Most Bravans have US relations and some have returned to build grand houses which they adorn liberally with stars and stripes and painted eagles. This makes Brava seem more prosperous and purposeful with more of an American work ethic than other islands. One American has opened the Manuel Burgos MOTEL, in Faja. 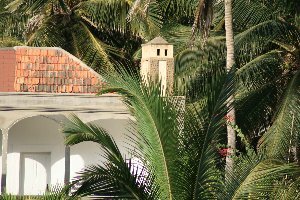 It is the best place to stay and in Brava and he will collect and return you to the port over bumpy roads through the steep mountains. The Motel is primitive but excellent value and overlooks a beach of black boulders and steep waves, which you can hear clashing at night. The people of Brava depend for every need on an unreliable transport system. During the 90’s the government inaugurated an airport in Faja D’Agua but TACV pilots refused to fly into Brava, because of its unpredictable winds. The airport was closed. Then a ship was given for Brava. The German Government supplied it.. The people of Brava rejoiced. The Government named the vessel Praia D’Aguada, after a beautiful beach in Brava. After operating for just a few months, it was deemed too expensive to operate top Brava. The ship left Brava. It can now be seen again on the Praia-Sal route, instead. 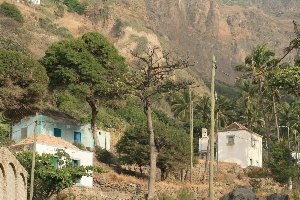 As the western-most of the southern Cape Verde islands, Brava island is likely to erupt volcanically in the future. Brava contains 15 youthful craters located along two or three lineaments intersecting along the crest of the island. The youthfulness of the craters and numerous minor earthquakes in recent years indicate that a significant volcanic hazard still existsin Brava. Most of the younger eruptions originated from the interaction of magmas with a large groundwater reservoir contained within an older volcanic series characterized by thick welded ignimbrites and block-and-ash flow deposits. Carbonatitic lavas are also found on Brava.